The main reason we wanted to get chickens was as a means of reducing the number of flies that show up when you have horses. Even more so when we heard they eat ticks, as well. I had no clue how much fun they would also be as social pets. Of course, there is the added benefit of eggs, too. That’s a feature that I have come to value much more highly than I ever imagined I would. Our flock continues to number twelve birds, which is really rewarding, but tends to make the inevitable threat of future loss more ominous, at the same time. 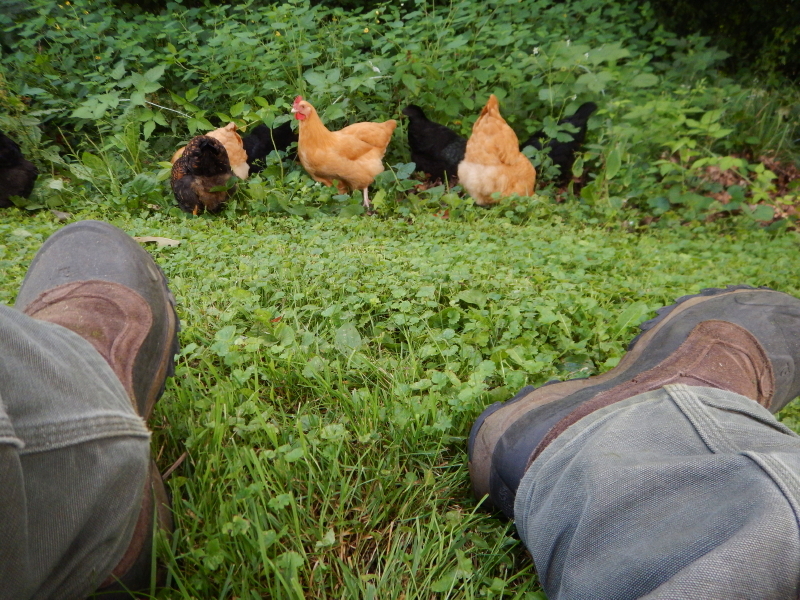 Lately, we’ve seen the chickens exploring ever greater distances away from the area around the coop and barn, which I am hoping means they are eating more and more bugs. Otherwise, they tend to spend the bulk of their time under the thick cover of the trees between the house and the fields. When we walk past, it is common to hear their 24 feet clawing the leaves that cover the ground, as they search for bugs to eat. My piles of composting manure no longer hold the shape I build up, as the chicken’s busy feet quickly wreak havoc in their search for precious morsels. 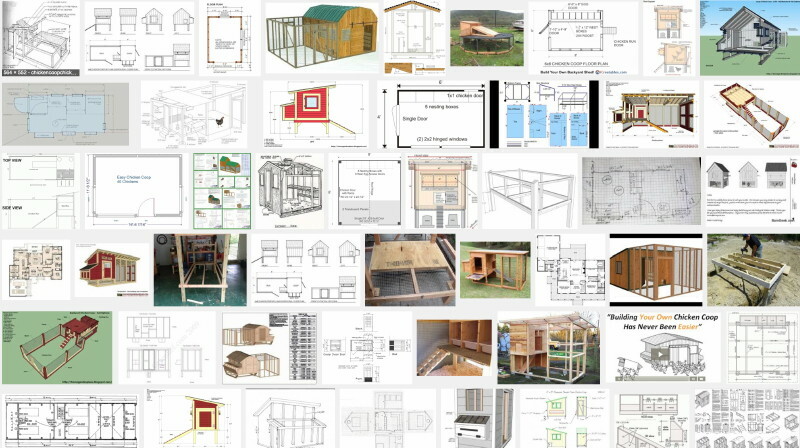 It’s a disruption to my sense of order which I gladly tolerate. 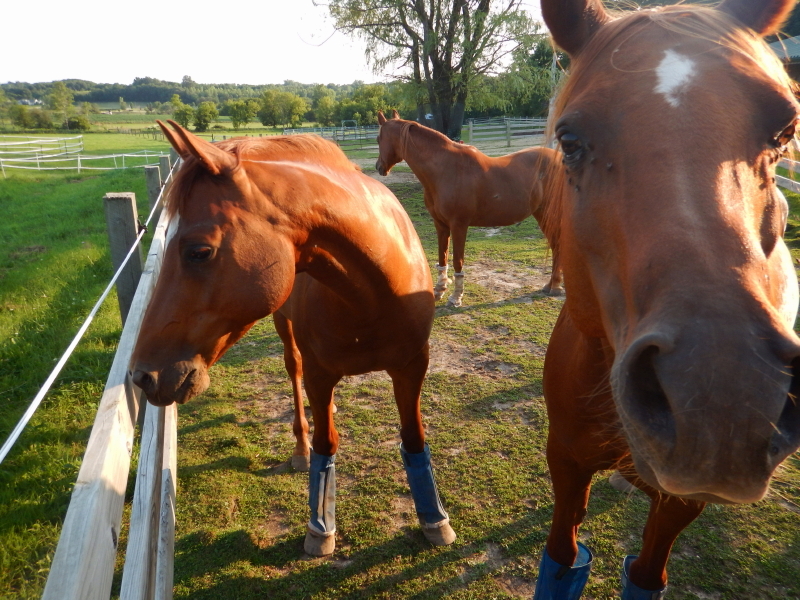 Despite all the bugs our chickens can eat, there remain plenty of flies that pester the horses. We put masks over the horses’ eyes, and this summer we are trying wraps on their legs. Horses will often stomp their feet to knock loose the biting flies and that repeated concussion takes a toll on their feet and hooves. 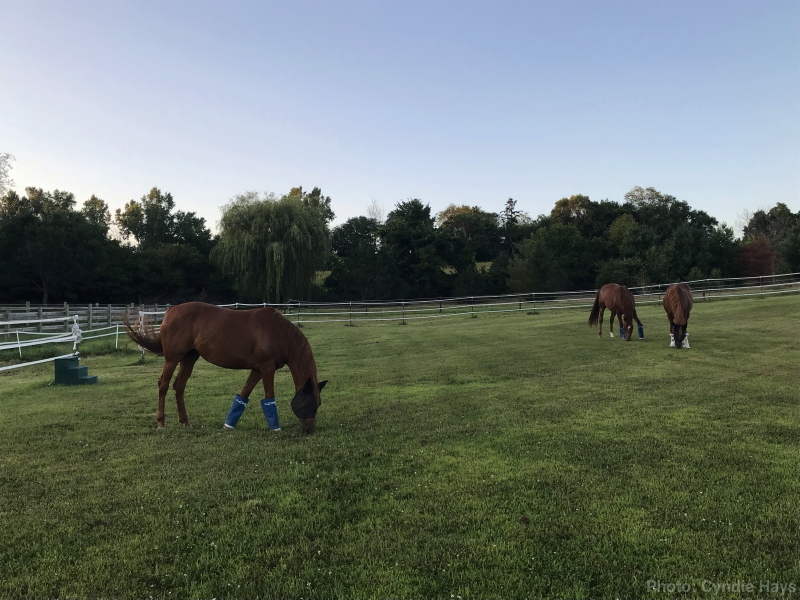 Cyndie gave them some time on the short arena grass at dusk yesterday, where they can get some reward that helps distract them from the relentless harassment of the flies. 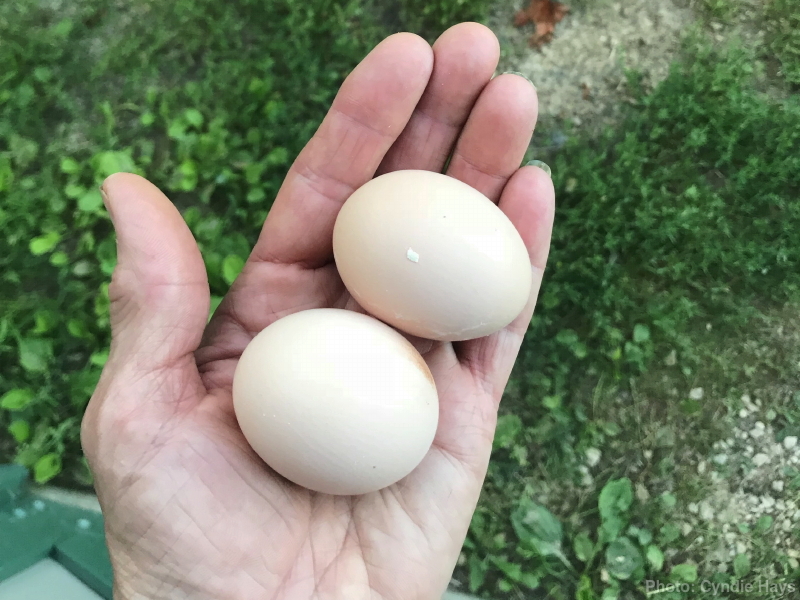 After that, Cyndie made a pass by the chicken coop to check for eggs and was rewarded with TWO eggs at the same time. Now we know there are two hens laying. The rest won’t be far behind. They might be our debuggers, but their eggs really are the crowning glory of our wonderful chickens. 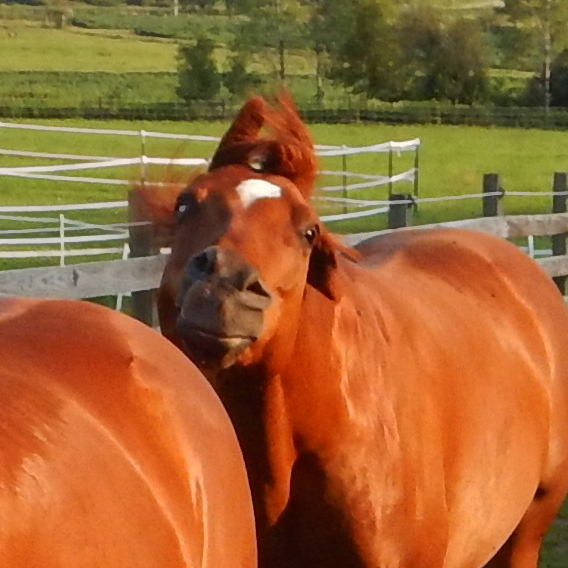 Sometimes I think the flies on our horses bother me more than they do the horses. Legacy approached me while I was raking up manure in the paddock yesterday, and my intuition told me it was about the flies. Lately I have been noticing increasing numbers of flies congregating around the eyes of our horses, so I went into the barn to get fly masks. Even though Cyndie tried these last fall with limited success, I figured it was worth another attempt. I may be anthropomorphizing their behavior, but the way the mares willingly accepted the protection while the guys rebuffed my offer like I was offending their egos, seemed to match a common human gender tendency. It took a lot of patience on my part to outlast Legacy’s hesitation about wearing one. Hunter never did give in, but of the 4 of them, he seemed to have the least problem with flies, so I let him be. I’m curious to find out if the masks will all still be in place this morning. At one point while they were grazing in the arena space, I tried one last time to get Hunter into a mask. I had tucked a ziplock bag with carrots into my pocket to offer a treat as incentive and walked toward a position to address Hunter. Legacy seemed to immediately read what was going on and approached me, cutting off Hunter from my attention. I walked around to rearrange my position, but it was obvious that Legacy was not going to give me any space. I walked away from him and he followed, closely. I decided to walk the entire perimeter to see how long he would keep this up. I was surprised to see him put in so much effort while out in the hot sun, but he stayed right in step on my heels. I made a couple of diagonals across the arena space and he was still with me. As far as I was concerned, he had just earned himself a carrot snack. I wouldn’t try again with Hunter, unless he chose to come to me. Later in the afternoon, I was sitting on the ground at the fence line of the grazing pasture, covering damaged insulation on an electric wire that had become tangled with my trimmer. While I was engrossed in my task, Legacy wandered up behind me. He nosed around some of my gear and then started eating grass right next to me. RIGHT next to me. He snorted his runny nose all over my arm. Next thing I know, I am being harassed by a cloud of flies. Legacy was sharing his flies with me! If I still had the mask with me that I was trying to get Hunter to wear, I would have tried it on my own head at that point. I was mowing the labyrinth yesterday when I had a series of episodes that made my skin crawl. Well, crawl more than usual for a day when I was sticky with sweat from summer’s heat and humidity, working outside with chainsaws and trimmers. There is always some dirt or plant matter pasted to the exposed skin of my arms. In the area I was working, there was also an ongoing battle with a multitude of insects that were taking great interest in my flesh. Down in the corner of the grazing pasture, on the edge of the woods, I was cutting up the tree I dropped to the ground on Friday, soaked with sweat and covered with debris. It gets hard to know when it is a bug on my skin, or something else. The gloves I wore had loose cuffs, and more than once I pulled them off because I wasn’t sure if what just landed inside was alive or not. I gained a new appreciation for the horse’s ability to twitch their muscles hard enough to dispatch flies. With both of my hands occupied on the chainsaw or trimmer, I was easy prey for the biting flies and mosquitoes. After a while, it becomes impossible to tell whether I am feeling something on me in a moment, or if it is simply residual sensation after whatever landed has flown away. 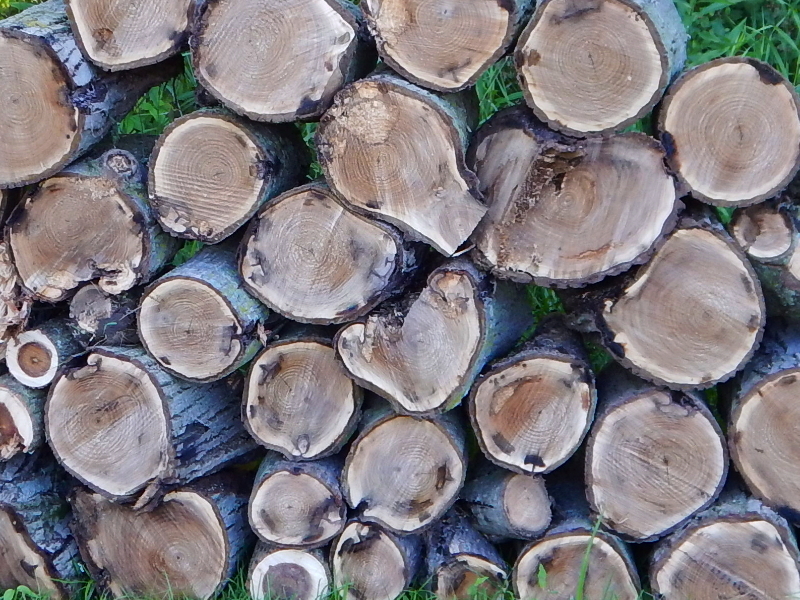 It was also a bit unnerving picking up freshly cut logs when I had seen millions of ants had been living inside the tree. Add to that, I am pretty sure that feeding the wood chipper and trimming the trail the day before put me in contact with poison ivy again. My skin was in a state of constant irritation. 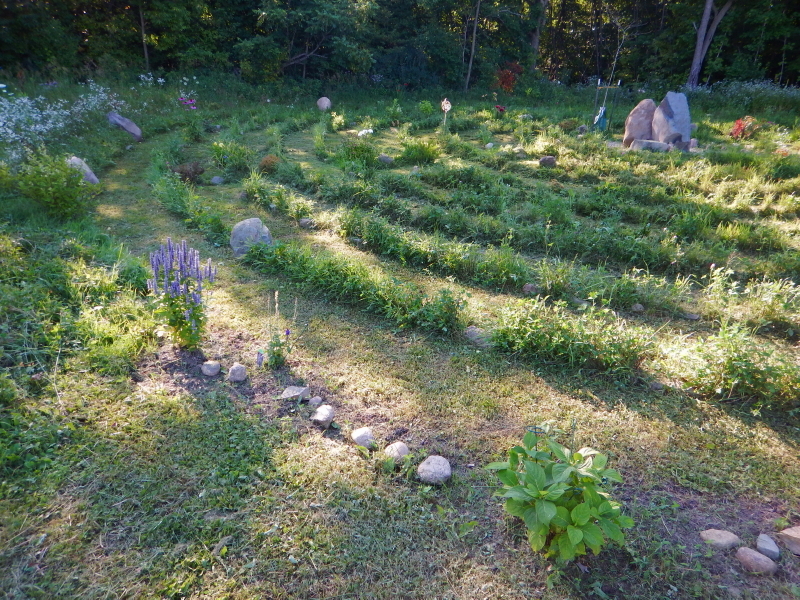 It culminated in creepiness late in the process of using the trimmer in the labyrinth. It had been a long day, I was tired, and I really wanted to be done. I had already been forced to stop earlier to reload the supply of plastic line in the trimmer head, so the only remaining delay would be a need for another refueling. In my push to finish, I didn’t stop to use my toe to convince the little frog to move out of the way, I just cut up behind him, assuming the noise and motion would naturally drive him off like usually happens. For some ghastly reason, he turned and jumped into the lethal spinning line. That stopped me. I shut off the engine and decided I would fill the gas tank anyway, setting my over-ear hearing protection with face shield on the ground. I topped off the fuel tank while swatting at things bugging my ears and trying to shake the heebie-geebies that frog had just caused. When I resumed trimming, I continued to have the feeling like there was a bug flying around my right ear, and wanted to let go of the trimmer to wave it away, but I realized I had on my ear protection, so I figured I was feeling residual phantom sensations. Or was it just left-over creepy feelings from watching that frog? I had to check, stopping to pull off the head-gear. A bug flew out. Really. What are the odds of that? It’s not as far-fetched as what happened next. I tried again to resume my task, and in moments, my left ear felt weird. I figured I was just being paranoid at this point, but was also feeling jumpier by the minute, so I paused the trimmer again and whipped off the ear muffs. GAH! I did the squiggle-jump-flinch as a spider crawled out. I gotta say, it felt extra-specially-good to finally step out of the shower last night, scrubbed as squeaky clean as physically possible. Out of respect for the whole truth, I must report that it isn’t always sunshine-happy-roses here at Wintervale, despite all my blissful stories. Yesterday afternoon, Cyndie got out of her car after work, hobbling on a sprained ankle. She reported that it happened as she was squeezing out time before work that she didn’t really have, trying to walk Delilah one last time before leaving. Delilah ran off with gusto, pulling Cyndie off-balance. With me trying to help out, doing more of the walking chores, we headed down to the barn to invite the horses into the paddock for their evening grain. I don’t know where he had been rolling, but Hunter arrived with dirt covering him, head to hoof. He was an absolute mess. Regardless the hindrance of her painful sprain, Cyndie wanted to try to clean him up. She worked her way into the paddock, with brushes and cleaning supplies. She turned to Legacy, who had a fair amount of dirt on his back, giving him the option of being groomed. He didn’t seem to want to hang around, either. As we stood at the gate, after exiting, Legacy appeared to want to give us one last message. He presented his backside and lifted his tail. Message received. 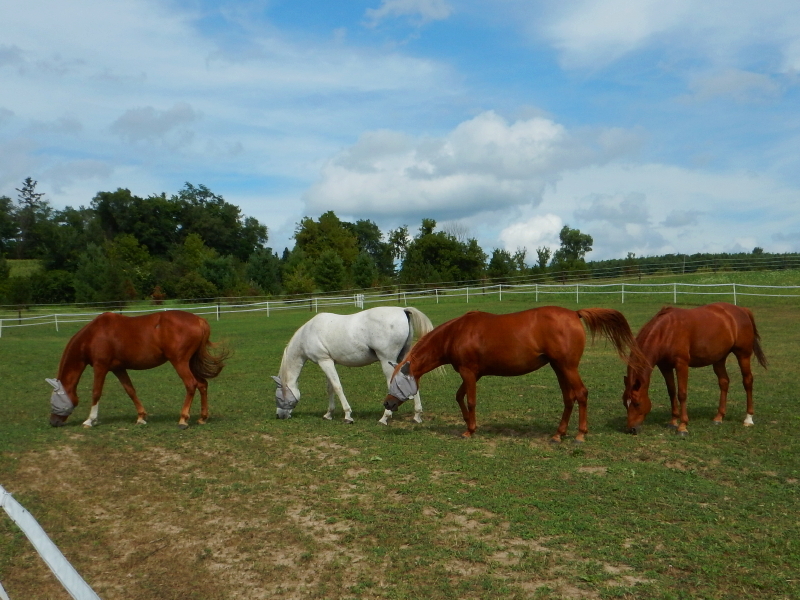 We left the sorry-looking geldings to strut their muddy body art. On Saturday, Delilah was confined to her crate in the house, while we entertained guests. 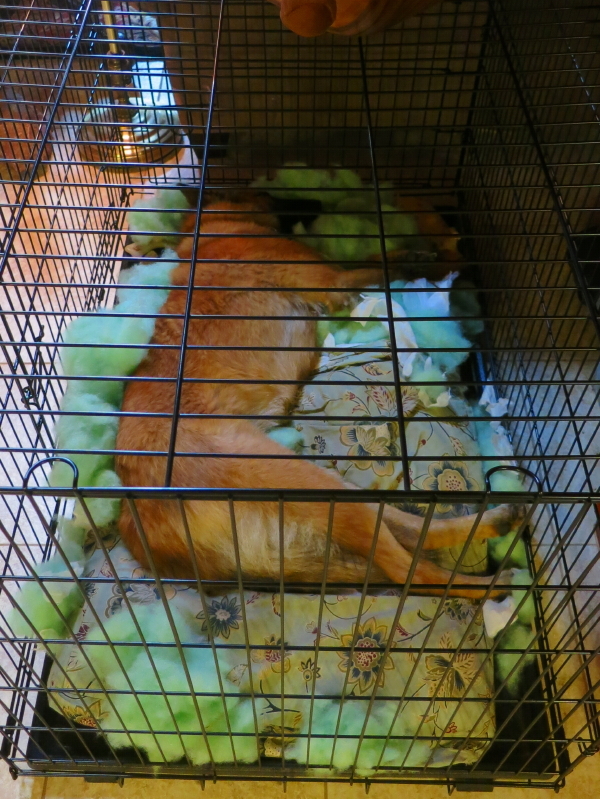 She made quick work of the bed Cyndie had tossed in there while cleaning. Ever so quietly, Delilah pulled the green stuffing out of it to surround herself, before lying down to nap. Shortly after coming inside with Delilah yesterday, as I brought a cold pack for Cyndie’s ankle, while she propped her foot up in the living room, I stepped in a pile of poop Delilah had covertly dropped on the rug the day before. That afternoon was when Elysa was over, and both she and I smelled something, but weren’t wily enough to follow our noses to the source. Discovery was delayed for 24 hours. Maybe we can blame Delilah for all the flies in the house. There has been an epic population explosion of flies around here this summer, and now that we have an unending supply of manure, the flies are thicker than ever. With Cyndie on the couch, pointing them out, I swatted at flies in a fruitless effort to curb the infestation. This was not one of our proudest days.